Is the cause really sectarian division? Could the meeting between Prime Minister Erdogan and Barzani be the solution to the problems in Iraq? Should Muslims Recognize the Identity of Atheists in Iraq? "Under the name of Islamophobia they have convinced the world that it is permissible and necessary to kill Muslims"
Since the 1990s, Iraq has been a country ravaged by the never-ending disasters; it has been dragged into such pitiful condition as the result of war, terror, dissensions, internal conflicts, sectarian strife, ethnic problems, domestic migrations and seemingly ceaseless suicide attacks. 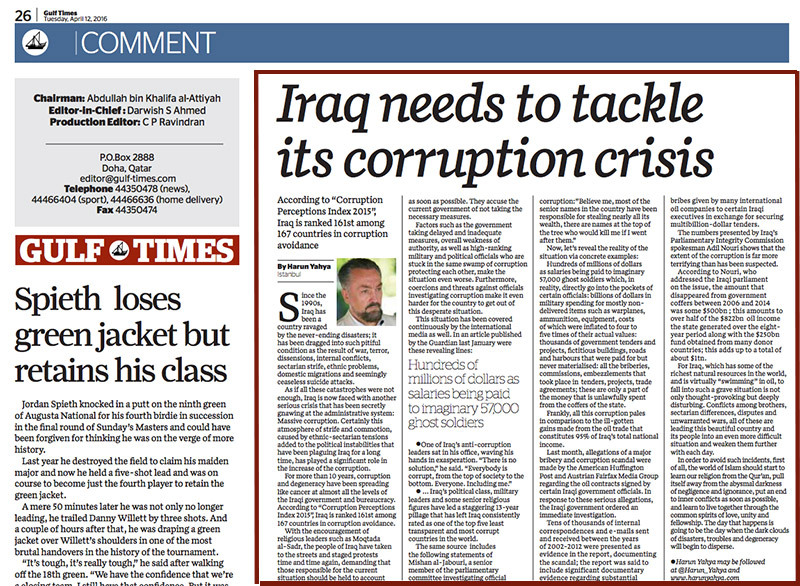 As if all these catastrophes were not enough, Iraq is now faced with another serious crisis that has been secretly gnawing at the administrative system: Massive corruption. Certainly this atmosphere of strife and commotion, caused by ethnic-sectarian tensions added to the political instabilities that have been plaguing Iraq for a long time, has played a significant role in the increase of the corruption. For more than 10 years, corruption and degeneracy have been spreading like cancer at almost all the levels of the Iraqi government and bureaucracy. According to “Corruption Perceptions Index 2015”, Iraq is ranked 161st among 167 countries in corruption avoidance. With the encouragement of religious leaders such as Moqtada al-Sadr, the people of Iraq have taken to the streets and staged protests time and time again, demanding that those responsible for the current situation should be held to account as soon as possible. They accuse the current government of not taking the necessary measures. Factors such as the government taking delayed and inadequate measures, overall weakness of authority, as well as high-ranking military and political officials who are stuck in the same swamp of corruption protecting each other, make the situation even worse. Furthermore, coercions and threats against officials investigating corruption make it even harder for the country to get out of this desperate situation. l … Iraq’s political class, military leaders and some senior religious figures have led a staggering 13-year pillage that has left Iraq consistently rated as one of the top five least transparent and most corrupt countries in the world. Hundreds of millions of dollars as salaries being paid to imaginary 57,000 ghost soldiers which, in reality, directly go into the pockets of certain officials: billions of dollars in military spending for mostly non-delivered items such as warplanes, ammunition, equipment, costs of which were inflated to four to five times of their actual values: thousands of government tenders and projects, fictitious buildings, roads and harbours that were paid for but never materialised: all the briberies, commissions, embezzlements that took place in tenders, projects, trade agreements; these are only a part of the money that is unlawfully spent from the coffers of the state. Frankly, all this corruption pales in comparison to the ill-gotten gains made from the oil trade that constitutes 95% of Iraq’s total national income. Last month, allegations of a major bribery and corruption scandal were made by the American Huffington Post and Austrian Fairfax Media Group regarding the oil contracts signed by certain Iraqi government officials. In response to these serious allegations, the Iraqi government ordered an immediate investigation. Tens of thousands of internal correspondences and e-mails sent and received between the years of 2002-2012 were presented as evidence in the report, documenting the scandal; the report was said to include significant documentary evidence regarding substantial bribes given by many international oil companies to certain Iraqi executives in exchange for securing multibillion-dollar tenders. The numbers presented by Iraq’s Parliamentary Integrity Commission spokesman Adil Nouri shows that the extent of the corruption is far more terrifying than has been suspected. According to Nouri, who addressed the Iraqi parliament on the issue, the amount that disappeared from government coffers between 2006 and 2014 was some $500bn ; this amounts to over half of the $822bn oil income the state generated over the eight-year period along with the $250bn fund obtained from many donor countries; this adds up to a total of about $1tn. For Iraq, which has some of the richest natural resources in the world, and is virtually “swimming” in oil, to fall into such a grave situation is not only thought-provoking but deeply disturbing. Conflicts among brothers, sectarian differences, disputes and unwarranted wars, all of these are leading this beautiful country and its people into an even more difficult situation and weaken them further with each day. 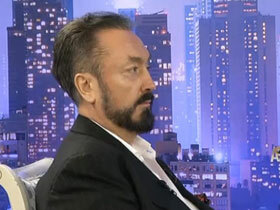 In order to avoid such incidents, first of all, the world of Islam should start to learn our religion from the Qur’an, pull itself away from the abysmal darkness of negligence and ignorance, put an end to inner conflicts as soon as possible, and learn to live together through the common spirits of love, unity and fellowship. The day that happens is going to be the day when the dark clouds of disasters, troubles and degeneracy will begin to disperse.